These two bots generate short template based sentences and publish them on Twitter every 10 minutes. With them Schneider demonstrates some of the versatility of the same kind of device when applied to different topics. 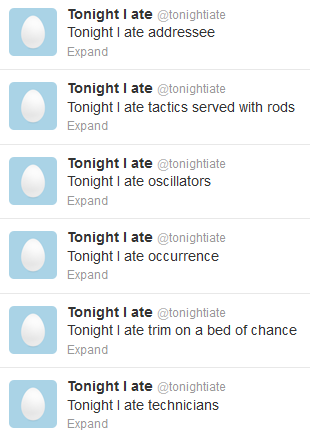 His first bot, “@tonightiate,” uses a relatively simple template that produces an obsessive litany of consumption. The opening constant phrase “Tonight I ate” reads like a musical refrain, particularly when read as a focused stream on the account page. The use of tonight evokes the semantic frame of supper through the time of eating reinforces it with variations of side dishes and garnishes. By pulling in random nouns as things to be eaten, the work creates delectable logical clashes, mixing semantic frameworks with the power of pure randomness. The opening phrase adjusts to the time of day, based on Eastern Time zone, which enhances its absurdity in the context of a global social network. The bot therefore serves tweet-sized portions of meaningful nonsense that comment on how everything can be consumed these days. Note: Schneider informed me that this poem was inspired by Tao Lin’s poem “i went fishing with my family when i was five,” available as a video of a live performance and a text version. “@MassageMcLuhan” focuses on a smaller but richer dataset: quotes and slogans from media theorist Marshall McLuhan. Schneider’s artist’s statement (linked to in the title of this entry), offers the source code in addition to this description. 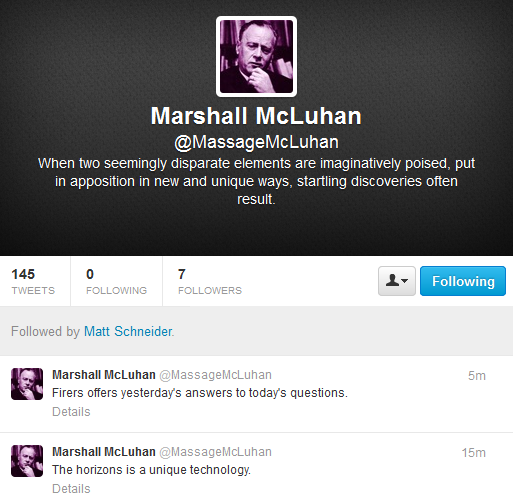 I created @massagemcluhan, a bot that would “massage” McLuhan’s quotes—work them over completely, as McLuhan would say. I’ve noticed McLuhan’s penchant for reworking and revisiting phrases (“the medium is the message” and “the medium is the massage” being the most famous), and thought it would be interesting to rework some of these phrases by substituting various nouns into them. And it does. Every ten minutes, an alternate reality McLuhan tweets a slogan that can vary from nonsensical to prophetic, and everything in between. Schneider’s artist statement offers close readings of some of the output, placing the McLuhan we know with one we recognize. And he’s right. We generally don’t notice a communication medium except when it malfunctions (and spoons rarely do). 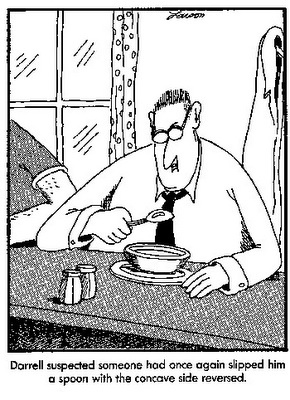 And even if there was any “content” in that spoon, I’m certain @tonightiate would’ve eaten it already.